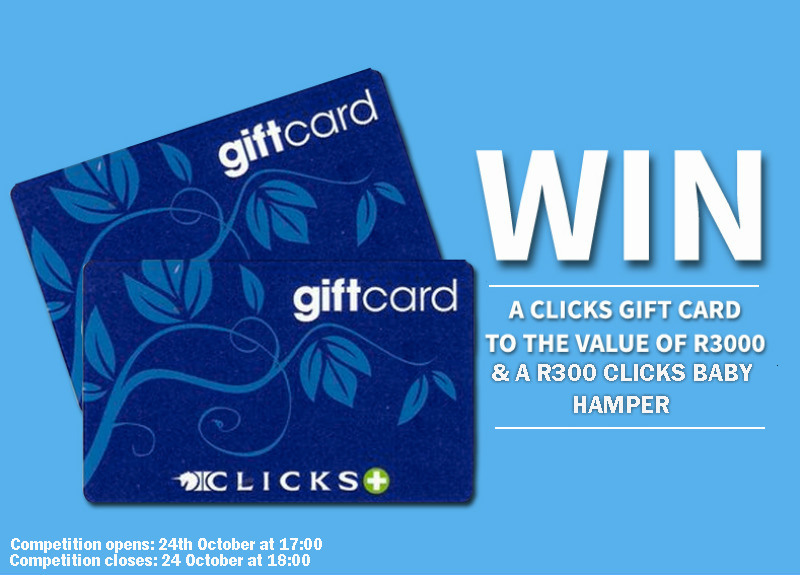 You could win a Clicks Gift Card to the Value of R3000 and one R300 Clicks Baby Hamper! SMS the keyword "Clicks" followed by your name, surname and city to 33650 within the Competition Period. 2.1. Entries for the Competition will open at 17h00 on Monday, 24 October 2016 and will close at 18h00 on Monday, 24 October 2016 (Competition Period). 4.1. SMS the keyword "Clicks" followed by your name, surname and city to 33650 within the Competition Period. 6.1. The Winner will receive a Clicks Gift Card (Gift Card) to the value of R 3 000.00 (three thousand rand) and a Made 4 Baby hamper to the approximate value of R 300.00 (three hundred rand) (Prize). 6.2. The Gift Card may be presented as payment for purchases only at participating Click's stores and use of the Gift Card shall be subject to standard terms and conditions for such Gift Cards. 6.4. The value in the Gift Card is only exchangeable for purchases at Clicks and may not be refunded or redeemed for cash. No cash will be given. 6.5. The Gift Card is valid until the date on which the full value has been redeemed or 36 (thirty six) months from date of issue. Any value remaining on the Gift Card at that date will be forfeited. 6.6. The Prize excludes all items not mentioned in clause 6.1. 7.9. We assume no liability whatsoever for any direct or indirect loss, harm or damage arising from your participation and/or any use of the Prize awarded in terms of the Competition. All persons, entering this Competition, indemnify and hold us harmless for any loss, damage, harm, death or injury (whether arising from negligence or otherwise) which may be sustained as a result of his/her participation in this Competition and/or his/her use of the Prize, or the use of the Prize by a third party.